"NAFTA" Free Trade Program Saves You Thousands! Metal-clad wood windows, choices of metal colors, insulated "Low-E" glass, premium hemlock interior frames, interior hardware. Available with opening casements, double-hung, awning vents, and larger fixed picture windows for maximum views. Prime and stain colors provided by customer. Wood Entry Doors, Douglas fir, choice of styles. Wood Interior Doors. Douglas fir, choice of styles including "Shaker" Douglas fir doors. Trimlite Doors website: click here. Timber frame custom entry, large finished 8"x and 10" Doug fir posts, beams and rafters. Visible cedar-pine sheathing in the eaves beneath the roof. 6” composite decking, choice of colors, special color-coated screws & hidden fastener systems. AZEK Fire-Rated, state approved: click here. Moisture Shield: click here. Westform Roofing offers best fire protection and appearance plus lower insurance rates. Easy installation. Features optional "Prolok" roofing with hidden fasteners. click here. Log siding, 8" pine or cedar with full 2"x6" corner, window and door trims. "Hardie-Plank" Cedarmill grain, choice of decorator colors, state-approved. Exceeds 1-hour fire-resistant rating, ideal for high fire danger areas; lower insurance rates. click here. Ask us about custom Woodtone wood-grain stains for Hardie-Plank "Cedarmill" Select Siding. Fir Beams, "Rough-sawn" or S4S display finish. Available in 6”x-, 8”x-, 10”x- and 12”x- material. Paneling, pine or cedar. Available in 1” x 4” and 1” x 6” T&G material. Solid 1" x 6” T&G Douglas fir floors. Stain and finish provided by customer. Call now for our special low mill-direct prices - Toll free: 1-888-358-1113. Note: The above items are available only with new Cabin Kit orders. Call us for quote. A very special "Thank You"
"We've been customers for years and there is no better home than a Cabin Kit Home. Top quality, and the best service you could ask for." "We love our cabin, thank you and your company so much." "We have been customers for seven-plus years and totally love our new Cabin Kit home!" 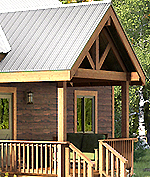 "We have several Cabin Kit homes in Arkansas and have been very happy with the quality and the big savings. "The panelized package is the only way to go! 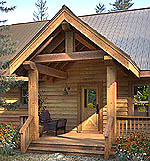 "Cabin Kit materials are top quality, kiln dried lumber. We saved over $26,000 with their much lower NAFTA pricing." "The quality of materials is terrific. This is our 4th Cabin Kit package. Your field support is great!" "We really enjoy our Cabin Kit home. The pre-built panels saved us weeks of building time and thousands of dollars in labor costs. "We love our cabin. Everything arrived as promised, we'd do it again in a heartbeat. Our builder said he had never seen such quality materials!" We saved more than $16,000 on our new Cabin Kit home, and have been customers for almost 10 years." "We couldn't be happier. Your design help was great, and the wall panels were perfect. The mountain view from the deck is better than we had hoped."